Taste test: These are decent nacho cheese tortilla chips. They're not particularly cheesy, and they're certainly not dangerously cheesy, but they're not bad either. 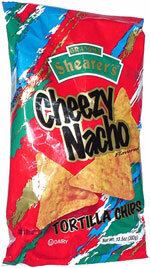 The weird stuff that Shearer's has written on the bag makes up for the average nature of the chips. I like the way they spelled "cheezy" with a Z. Smell test: Smells like the spices from nacho chips, but not really the cheese. From the package: “Yes folks, only Grandma Shearer is crazy enough to think you'll actually sing this song. But if you are ... you're our kinda folks!" "So take off your shoes and get them feet a flappin'. It's time to have a yabba dubba good time. Sung to the tune of 'The Flintstones'." 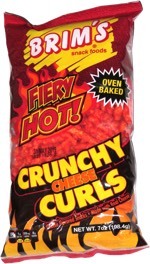 Where there's Chee-zy Nach-os we can meet!